Lower scores accompany better foods. Click on a bar to see pastry dough with that score. 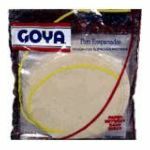 Label for Goya Discos Dough for Turnover Pastries captured by LabelINSIGHT on Nov 18, 2016 Tell us if the product name is misspelled. The product score is based on weighted scores for nutrition, ingredient and processing concerns. Generally, nutrition counts most, ingredient concerns next and degree of processing least. The weighted scores are added together to determine the final score. Read more about scores here. EWG scored on three factors: nutrition, ingredient concerns, and the degree of processing. Read the full scoring methodology. Considers calories, saturated fat, trans fat, sugar, sodium, protein, fiber and fruit, vegetable and nut content to differentiate between healthful and less healthful foods. For more information on nutrition concerns, read our full methodology. Considers food additives, pesticides, hormones, antibiotics and contaminants like mercury and BPA, which can affect human health and the environment. For more information on ingredient concerns, read methodology. Estimates how much the food has been processed. Considers many factors, chief among them, modification of individual ingredients from whole foods and number of artificial ingredients. For more information on processing concerns, read our full methodology. Products with moderate and high processing concerns generally have more artificial ingredients, more ingredients that have been significantly modified from whole foods, and more ingredients overall. Products bearing the USDA certified organic seal must contain at least 95 percent organic ingredient, and must be produced without the use of synthetic pesticides and fertilizers and free of genetically engineered ingredients. Artificial trans fats are produced when vegetable oils are subject to extreme temperatures or pressures to solidify the fat and increase shelf life, flavor stability and palatability (FDA 2013). These modifications benefit the manufacturer but are detrimental to the consumer's health. Health experts at the Institute of Medicine recommend "that trans fatty acid consumption be as low as possible" (IOM 2005). The CDC estimates that eliminating artificial trans fats could prevent up to 20,000 heart attacks and up to 7,000 deaths each year (Dietz 2012). In 2013, the FDA made a tentative determination that trans fats from partially hydrogenated oils (the primary dietary source) should no longer be generally recognized as safe (FDA 2013). Some trans fats do occur naturally in meat and dairy products. These natural trans fats may be of lower concern; some studies have found them to be beneficial, while others have found their effects to be neutral (Chardigny 2008; Mozaffarian 2009; Wang 2013). Eating too much of any type of sugar can lead to tooth decay. Added sugars like high fructose corn syrup, honey, sugar and dextrose are more concerning than natural sugars like raisins because they can lead to obesity by adding calories without being accompanied by important nutrients like potassium, vitamin C or fiber. Americans average 22 teaspoons of added sugar a day (NCI 2010; USDA and DHHS 2010). The World Health Organization recommends no more than 6 to 12 teaspoons of added sugar a day for adults, children should eat even less (WHO 2002; WHO 2014). Why GE Foods are not "Natural"
ENRICHED BLEACHED WHEAT FLOUR (WHEAT FLOUR, MALTED BARLEY FLOUR, NIACIN, IRON, THIAMINE MONONITRATE, RIBOFLAVIN, AND FOLIC ACID), WATER, VEGETABLE SHORTENING (INTERESTERIFIED SOYBEAN OIL AND/OR PALM OIL), SALT, DOUGH CONDITIONER (CORN FLOUR, L-CYSTEINE HYDROCHLORIDE, ASCORBIC ACID), FERMENTED WHEAT FLOUR, CORN SYRUP SOLIDS. Products remain in the database for two years after their label information is recorded in stores. A product with label information last recorded more than a year ago is marked with an * identifying it as an older product. Products remain in the Database for two years after their label information is recorded in stores, even when they have been discontinued (products may remain in stores and pantries long past the date they cease to be manufactured). EWG marks a product it is aware has been discontinued with a banner identifying it as such. Scientists have not determined whether GE food poses risks to human health. Still, consumers have many good reasons to avoid eating genetically engineered ingredients, including limited safety studies, the development of "superweeds" and increased pesticide use. For more information on the topic visit: http://www.ewg.org/research/shoppers-guide-to-avoiding-ge-food Note: The presence or absence of genetically engineered ingredients or ingredients derived from GE crops does not affect a product's overall score. While over 160 food ingredients may cause allergic reactions current Food and Drug Administration (FDA) regulations stipulate that 8 major food allergens must be labeled on products. These allergens include; milk, eggs, fish, crustacean shellfish, tree nuts, peanuts, wheat and soybeans. Note: The presence of potential allergens does not affect the overall product score. LabelINSIGHT transcribes label information from product packaging pictures. The resulting data pass through a complex computer program that checks for data inconsistencies, but occasional spelling errors persist. By submitting a suggested correction, you help make the database stronger and easier for other consumers to use. Thank you.